A Clowns Without Borders project starts with an invitation. After receiving a call to bring laughter to those experiencing crisis a new project unfolds. We assess the situation and prioritize requests based on need, project expense, the capability of our in-country partner(s) to support us logistically, and the safety of any potential artistic troupe. 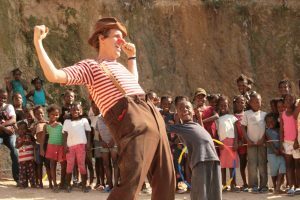 Working closely with our in-country partner(s) we determine which clown skills are best suited to the situation, select the number volunteer clowns needed, and establish the project’s dates. Next, we send out the call for volunteers by drawing from our roster of professional performing artists. and support the volunteers with their preparations for travel. Most Clowns Without Borders tours are between 14-21 days long. The project officially begins when the team of clowns boards their flights for the destination country. It’s not uncommon for the team to meet for the first time after arriving in-country. The strong foundation of performance skills required is why we only work with professional performers. During the first 24 hours of landing, the team builds the performance and spends the day practicing and perfecting the show. In the first day, we also connect with our in-country partner(s). What is created during the rehearsal day will grow, adapt, and change throughout the course of the tour, as the team gets to know each other. The clowns spend the rest of the trip working. We try to cap it at two to three engagements per day, though on some projects we find ourselves in as many as seven or eight engagements! We hold free performances that can last between 30-90 minutes. On some projects, we also run skill-building or psychosocial support workshops. The team travels extensively to reach as many people as possible. For every five to six days of work, we ask the team to take a day to rest and decompress. Our teams debrief as a group at least every other day to check-in with staff, share any challenges, emotions, or insights that are coming up, and to resolve any potential conflicts before they start. We believe in the transformational power of positivity and levity, and our teams live that power on every CWB project. We journal about the experience, making observations about the incredible people we serve to advocate on their behalf. We take photos when appropriate, and track the number of people attending our free shows and performances. As the project draws to an end, we often find that we are asked to return. Requests to return to a country is often how a single project turns into a recurring program. 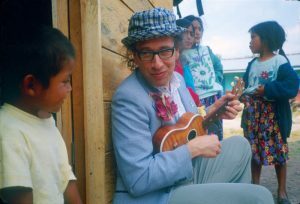 A project series can take place over decades, such as our work in Chiapas, Mexico. A project series can also take us several times to the same place in the same year, such as the five projects of 2011 in Haiti. We go where the need is the greatest. Continuous laughter-relief is necessary to face long-term hardships. Our commitment to communities in crisis is non-discriminatory. We return when the children ask us, “When are you coming back?” Pledge your support to bring laughter to communities in crisis. What is A Typical Project? The clowns wake up at a massive humanitarian relief base in South Sudan. We wake early and grab breakfast at the commissary because today we are traveling! After breakfast we meet our contact from the major aid organization, pack up our small bags and show props, and head for a charter plane to an aid base in a different region! At this point, it is too unstable for our team to travel by road, even with the security services of our partner organization. The flight takes only 75 minutes, and we arrive with no time to lose. We touch down, meet our new point of contact and drop our bags off in the tents we have been provided for sleeping. Quickly, we change into our costumes and hop into the back of an aid truck to be driven to our first performance space: a big soccer field! We perform for 800 children and women who seemingly appear out of nowhere, then we stay and play for an hour after the show. After we finish playing, it’s back to the base for a quick lunch, then a workshop with 20 aid workers who are being surprised with this workshop instead of their staff meeting! It’s a challenge for some, but incredibly fun for all, and a participant says that he feels we’ve given him back his joy–something he hasn’t felt since beginning his post at this base. That’s the end of our performance itinerary for the day, so we take an hour to wash our clothes/journal/have personal time, then reconvene for dinner. We talk about what went well and discuss changes to be made to the show and workshop. Lastly, we have a team check-in. People are feeling tired but very positive. We go to bed early, exhausted as usual and excited to begin the cycle again tomorrow!